Cure Beat is set to join her Suite! 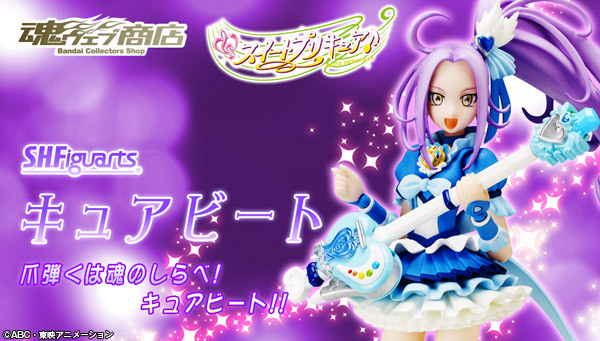 Precure companions in the S.H.Figuarts collection in March 2016 as the next Precure Tamashii Web Exclusive release. Fans of Suite! Precure were excited to see Cure Beat finally gracing the stage of the S.H.Figuarts line along with Cure Melody and Cure Rhythm at a recent Tamashii event. After much patience, Cure Beat is finally ready to take the stage herself this coming March, 2016. The figure is slated to include eight additional hands, three additional face pieces, the Love Guitar Rod, the Soul Rod, an alternative neck joint, and an exclusive Tamashii Stage stand. Cure Beat is priced at ¥4,860 before any sort of additional middleman fees. As a Tamashii Web Exclusive, the figure is only available through the Tamashii Web Shop, and can only be purchased by those living in Japan. Be sure to contact your preferred middleman service to pre-order this figure.